There are so many challenges to the old idea of the European Union. Now we are seeing an existential crisis for Europe and not just as an organization but as a concept and idea, says Lode Vanoost, former deputy speaker of the Belgian parliament. RT: So the EU says it's concerned by the reforms, while Poland claims it's an internal matter. Who will win? Lode Vanoost: You would not have heard from me many times before that I agreed with whatever the EU policy and statements were. But this time I am fully on the side of the interpretation of what’s happening in Poland by the EU. This is not about European values. This is about just about democratic values – universal values. The idea that once you form a majority government, you would have total power and that the opposition would just disappear [from] the media is outrageous… But governments in other countries in Europe do. For example, you establish a board of directors for the public media where the majority has a majority of the seats but not all seats. You can discuss that in detail but to state it is just an internal matter…what is happening here is that the political party that takes as a concept of power that once you’ve won elections, you have total power. 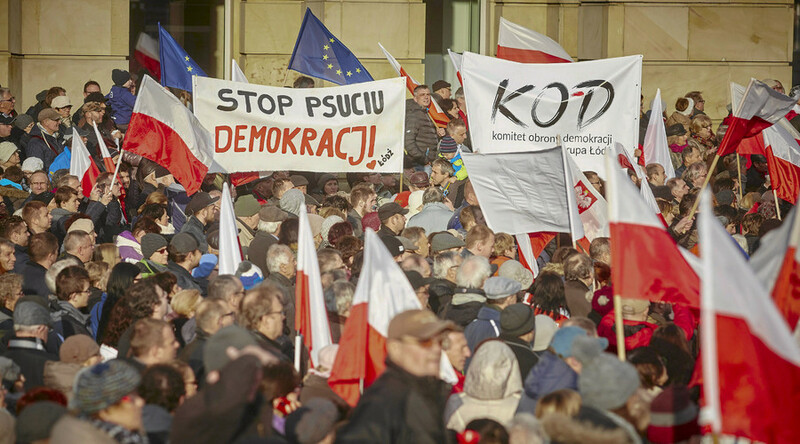 RT: The EU is pressing the democratically elected government in Poland. How fair is the EU pressure? LV: … The government does have democratic legitimacy but decisions made by a democratic government based on a majority must have themselves also legitimacy. And to claim that once you have a majority of seats in the parliament, that you can change everything, you can change the boards…and constitutional court and nominate only people from your side that is not at all how democracy works. In a real democracy you have a majority and you have an opposition, you also have the rights of a minority – the ones who are not in power at the moment, who could become the next majority. To exclude them from the media? Public media must be transparent, pluralistic in a democracy. To claim that you can turn the public media completely on your own side – that is not democratic at all. RT: The EU has proven it's ready to take action in this row. Are we going to see this rift deepen? LV: I have to say what Poland is doing out in the open, quite brazenly has been happening in other countries as well: in Spain, in Italy the laws on the media have been reformed. They do it most certainly, but the idea that as a government you have total control of the public media and of the things like the constitutional court is not an idea that is only happening in Poland. The problem there is that they are doing it so brazenly and openly and that they will send a precedent for other countries. RT: Do you think they are doing it so brazenly as a form of challenge to the EU? RT: Another Euroskeptic government, Hungary, has taken Poland's side in this conflict. Is the EU ready to for a stand-off in the East? LV: Whether they are ready for this, I don’t know, but this is really going to be a head on a collision of not just ideas but the concept of democracy. It is not a coincidence that this is happening in the Eastern European countries that have joined the EU in the last 15 years only. So, they are junior members. And apparently they do have some leftovers from past times – the days when the totalitarian systems ruled and apparently some of these people are longing for these days again, which is what is happening out in the open in Poland and a bit more hidden but similarly in Hungary. This is indeed a very same evolution. RT: With Britain possible exiting the EU, open borders under threat, and an influx of refugees. Is the EU now just facing a string of challenges to its authority? LV: I am really hesitant when I say does the European Union have a solid future. I doubt it as there are so many challenges to the old idea of the European Union. I think it is not just the deepest crisis but this is an existential crisis for the EU and not just as an organism but as a concept and idea.